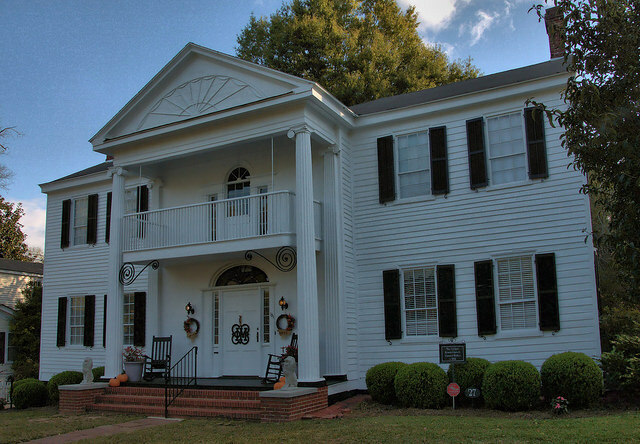 Now in use as a sorority house, this is one of the best exemplars of the so-called Milledgeville-Federal Style. The Cedars originally fronted Clarke Street and a cedar-lined circular drive marked its entrance, hence the name. Charles W. Howard was the first owner and Daniel Pratt is thought to have been the architect. Formal gardens at the original location were designed by Irish landscape gardener Patrick Crane. Other owners have included the Jarrett, Scott, Prosser, Moran, Tigner, Smith, and Garrard families, among others. There is an antebellum house which was originally built in Woodville, GA and then moved to Atlanta/Morningside area in the 1980’s which is attributed to Daniel Pratt. Unfortunately, it will be demolished soon if someone does not step forward and offer to move it. The address is 1385 Middlesex Avenue ATL I hope that you have the opportunity to photograph it and document this beautiful home before it is destroyed. A fine Federal!! And the portico appears to be original! When we bought the house from the family of Alice Garrard in 1992, we were told that the house, which originally faced Clarke Street, was turned 180 degrees and pulled to its current location by mules in 1911.